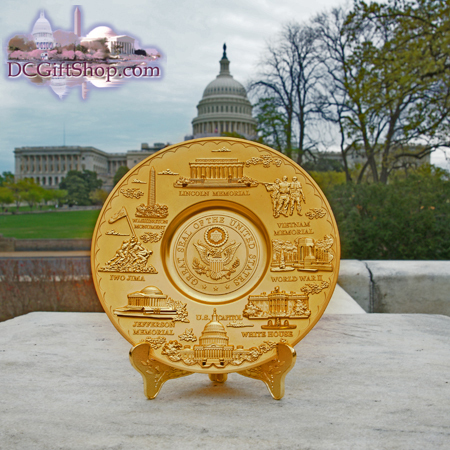 A great souvenir to remember your trip to Washington DC by or simply for anyone who is a patriot at heart, DC Gift Shop is pleased to offer a new design of our Washington DC souvenir plates collection. The main feature is the Great Seal of the United States in the center of the plate. The Great Seal is accentuated by some of DC's most famous landmarks. Clockwise they are: the Lincoln Memorial, the Vietnam Veterans Memorial, the World War II Memorial, the White House, the U.S. Capitol Building, the Jefferson Memorial, the Iwo Jima Memorial and the Washington Monument. Comes with a gold colored display stand, is all-metal construction and measures 6.5 inches in diameter.